Christ stands at the centre of the composition, his right hand raised above Lazarus who lies on the ground partly supported by a woman. To the right the hooded figure of his mother kneels, her arm outstretched. Behind her is a man with a spade. Men and women crowd around, including a mother clasping her child, seated above and to the right of Christ. The scene is framed by a broken arch and a fluted column. The drawing of the scene is fluid, and the gestures of the elegant elongated figures give the impression of arrested movement. The glass painter has used enamel paints over much of the scene, delicate blues are modulated almost like water colour and placed over yellow stain to give varied greens of foliage and grasses. Brown painted architecture is given a variety of shadings and the modelling of exposed limbs is convincing. The whole composition is dominated by Christ’s radiant yellow and orange halo. The panel is after Abraham Bloemaert or a similar version by Joachim Wtewael, both deriving from a fresco by Federico Zuccaro of 1561-64. The glass painting is in the same orientation as Bloemaert's original drawing of c.1590. The corresponding painting of this subject, and engravings by Jan Muller, c.1601-2, and Jacob Matham, are in reverse. 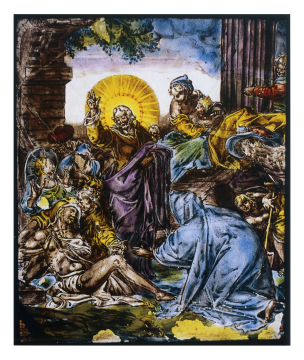 About two-thirds of the scene is used in the glass painting, with cropping mainly from the left of the drawing; otherwise it closely approximates the original design. Popham gave a date c.1580, suggesting an attribution to Pieter Cornelisz? F. W. H. Hollstein, Dutch and Flemish etchings, engravings and woodcuts ca. 1450-1700. Amsterdam: Rijksmusem, 1949– XIV; Jan Muller, 13.